New Year celebrations will be special this year at the Baku Boulevard, as the population will have an opportunity to welcome 2014 - Year of the Horse - in the air. "A new observation wheel dubbed "Baku eye", which is supposed to come on stream on December 25, will have a special service that provides the opportunity," Nazim Majidov, the official at Baku's National Seaside Park said. Baku eye is one of the tallest observation wheels in Europe. The construction operation is finished and the final safety measures are underway. 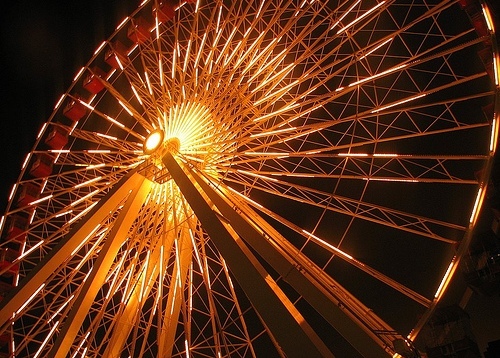 Before the New Year, the area around the wheel will be covered with greenery and special lighting system. Moreover, the highest New Year tree in the city will be placed near the new attraction, which will definitely attract even more visitors. Altogether, some 15 New Year trees will be placed at the Boulevard. The height of the new "ferris wheel" is 60 meters. The wheel has 30 cars, each of which can fit eight people, thus the wheel can serve some 240 people at the same time. Baku eye, which is two times larger than the current big wheel functioning in Baku, was built from the materials brought to Azerbaijan from the Netherlands. The world first big wheel was designed by George Ferris, a bridge-builder from Pennsylvania, USA. He built the "Ferris Wheel" for the 1893 World's Fair, which was held in Chicago, to rival the French "Eiffel Tower", built for the Paris World's Fair of 1889. The Ferris Wheel was considered an engineering wonder, the wheel section had a diameter of 75 meters, two 1000-horsepower reversible engines powered the ride of thirty-six wooden cars held up to sixty riders each. From that time, the amusement became very popular around the world. At present, the highest wheel is "Singapore Flyer", constructed in 2008, with the height of 165 meters. However, the Flyer's record is expected to be beaten by an observation wheel in Las Vegas, the U.S., which will come on stream next year. It will be 100 feet taller than the "London Eye", which opened in 2000, 30 feet taller than China's "Star of Nanchang", which opened in 2006, and nine feet taller than the "Singapore Flyer". Again, chase for the tallest wheel continues and the "Las Vegas Strip" may claim the highest for a while, as New York is planning to establish a 190 meters ride on the waterfront.